Abuja — A former Deputy Governor of Central Bank of Nigeria (CBN), Professor Kingsley Moghalu, yesterday in Abuja declared his intention to contest the 2019 presidential election. He said it was time to stop recycling failed politicians and regenerate the leadership ranks with competent and experienced young men and women. The presidential hopeful who refused to name the political party he intends to use for the election, challenged the youths to prepare themselves with the relevant qualifications and take over the mantle of leadership, adding that the struggle is about the future of Nigeria, not its past. According to him, "The battle to reshape Nigeria into a strong and capable country requires competence, capacity and character, and as a citizen who aspires to be a president, I possess all three. "If it is about competence, my work as a deputy governor of the CBN who played a leadership role in rescuing and stabilising the Nigerian banking system after the global financial crisis speaks for itself. "If it is about capacity, my work in the United Nations reconstructing countries torn by civil war or reforming the internal workings of the world body is there for everyone to see. "If it is about character, well, talk to my colleagues, mentors, friends, and of course my family, and listen to what they have to say. Strong, knowledgeable guidance is needed as Nigeria navigates these difficult waters, and I offer myself for service with a solid track record of leadership." 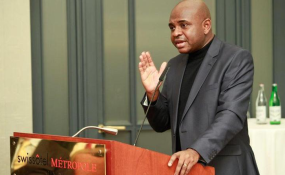 Moghalu said his decision was predicated on the fact that Nigeria today is divided by ethnic and religious conflicts, made worse by corruption while the government has failed in its very first duty of securing lives, and as citizens. We have lost their place in the world." He added: "The time has come for us to fix this. We are collectively exhausted by these politicians who continually fall in and out of alliances with one another and don't care for the ordinary Nigerian. "They aggravate our fears in the hope that we will continue to keep them in power even though they offer nothing new. "It is time for a radical change in the political leadership of Nigeria. It is time for a visionary, competent and inclusive leadership that truly cares about our country; it is time for a leadership equipped with the skills, intellect and competence to wage a decisive war against poverty and unemployment. "It is time for a Nigeria in which our youths can fulfill their full potential and our daughters can aspire to any opportunity they desire. It is time for a 21st century leader to lead us into a new and different future." He added that what the country needs now is a real movement of the people, by the people and most importantly, for the people of Nigeria to move the country forward and break with the troubled past, offering himself as part of that movement. Talking about the potential of Nigeria, the former CBN deputy governor said: "We are a country of great people as seen by the way Nigerians abroad are thriving. We hear the stories of those who leave home with little more than a hope and a prayer, but change the world abroad." Moghalu said Nigerians have smart, ingenious, drive, relentlessness, vision and sheer force of will, and must be able to harness their strengths and make them work for them here at home.Quoting the immortal words of former United States President, John F. Kennedy, Moghalu said: "Politics is too important to be left to the politicians," adding: "We must ask our government hard questions about the promises they made about our security, power, civil aviation, healthcare, and women's rights." He continued: "The world is changing. Time and tide have in several countries swept away old orders and brought in new, more dynamic ones. Nigeria must not remain stuck in its past. We, you and I can do it for our country too. "We need to modernise, and make it quickly. For instance, we know that women in leadership and in government can accelerate growth for any economy, yet only six percent of our legislators are women. There are many competent, smart women who are more than ready to dig in and work together to rescue this country. We must draw them out and ensure that their voices are heard. "I'm not here to tell you that there are quick, easy solutions to our country's problems. Far from it, decades of economic and leadership mismanagement cannot be undone in a few weeks or months. Things will be difficult and painful choices will have to be collectively made." Explaining his policy agenda, he said his vision for the country is set out in his new book, 'BIG' (Build, Innovate, Grow), which was released two days ago. Summarising the agenda, Moghalu promised to compose a world-class 'first eleven' team based on merit and inclusive governance to drive government policy; establish and propagate through the educational system a foundational philosophical worldview for the Nigerian state, around which all Nigerians will unite in a common purpose." He added: "Lead a consultative political process in cooperation with the National Assembly to achieve a constitutional restructuring of Nigeria and return our country to true federalism for stability and prosperity by 2021." The presidential hopeful also promised to implement a 50:50 gender parity policy in all political appointments-nearly double the ratio recommended by the National Gender Policy of 2008; establish and implement a Diaspora engagement and return policy and strategy as a new, fundamental component of the national quest for development as has been the case in China, India and Israel, saying his government will build the Diaspora Commission approved by the National Assembly into an effective, world-class institution to accomplish this important agenda. On economy, he promised to establish an innovation-led economy, with intellectual property and commercialisation of local innovation as its bedrock; establish a Venture Capital Fund with a minimum of N500 billion as a public-private partnership (PPP) to invest in the creation of new businesses by presently unemployed youths in Nigeria; the new businesses created with support from this fund will in turn create new jobs.